Bible verse reminders found in my grandmother’s Bible. This is day 22 of Photo 365. 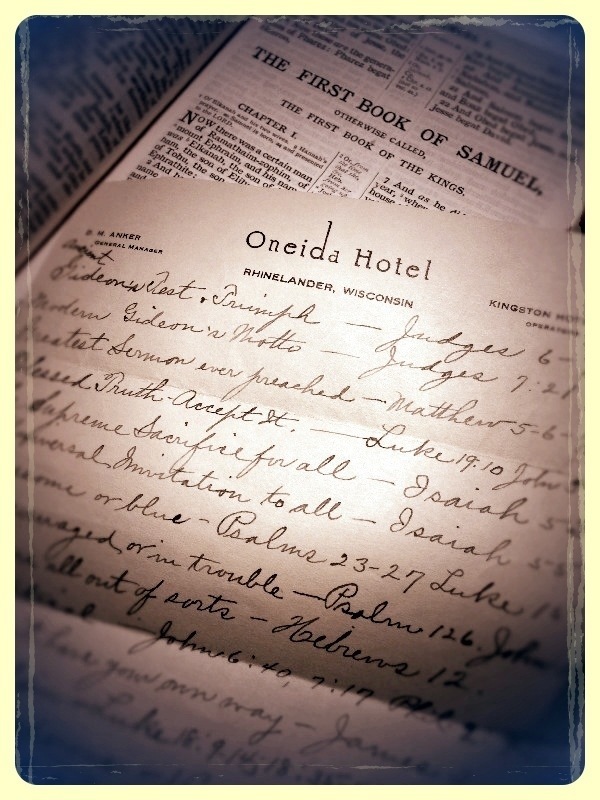 This entry was posted in Photography and tagged Bible, Photo 365. Bookmark the permalink. Was that from grandmother Ruth’s bible? What a blessing to still have that! Probably when she was studying there. Is that near where she went to school? Could you scan the verses for me and email me a copy? I miss her, too. What a woman! I would love to see what touched her heart from God’s word. My email is : lisalastdupree@yahoo.com. Thanks! YES, of course. I will scan the document and email it to you. It’s a treasure. What a wonderful spiritual legacy she left you! That she did! Seeing her handwriting again feels like she’s in the next room. Wonderful, blessed memories.